In a Nutshell: Canada’s BlueShore Financial is not your typical financial institution. For the last 14 years, the British Columbia-based credit union has differentiated itself through a Financial Spa concept that combines a luxury experience with sound financial advice. 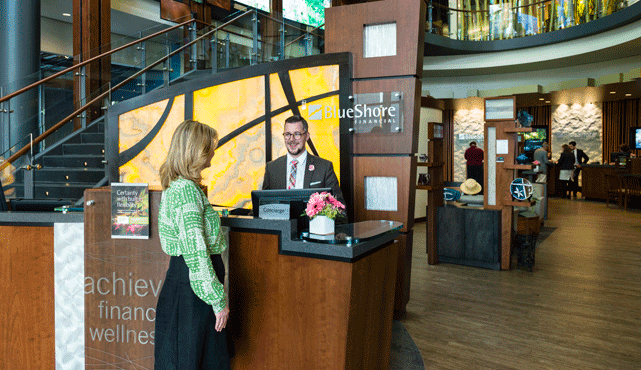 BlueShore Financial’s Spas focus on providing member-centered amenities, including coffee bars, jazz music, artwork, and children-friendly corners, as well as offering free wifi and phone-charging stations. Additionally, a key component of the BlueShore Financial experience is the clients’ deep relationship with their accredited financial advisor, who provides the face-to-face expert advice and support clients need to make well-informed decisions to meet their financial and lifestyle goals. Thanks to the credit union’s unique approach, 79% of BlueShore’s clients state that BlueShore improves their financial well-being, compared to 62% of clients at other financial institutions. And the concept is continuing to grow, with BlueShore planning another Financial Spa location in Kerrisdale in Vancouver’s west side in 2018.
Credit unions provide many of the same services as banks, such as savings and checking accounts, credit cards, and online banking. Unlike banks, however, they are member-owned financial cooperatives — meaning those who have accounts are, collectively, the owners. As such, the main purpose of a credit union is to serve its members, rather than maximize its profits, and surveys have shown that customers are more satisfied with credit unions than banks as a result of that dedication. In Canada, more than a third of the population belongs to a credit union, with approximately 10 million total members, giving the country the world’s third-highest membership in credit unions, following the US and India. Credit union membership is particularly popular in Western Canada, where BlueShore Financial has been a long-standing part of the community since 1941. BlueShore has a dozen branches along the Lower Mainland and Sea-to-Sky corridor, and the credit union serves more than 40,000 members. The concept is popular among both clients and financial institutions. We recently spoke with BlueShore Financial’s Reg Marrinier, Senior Vice President of Retail and Business Banking, who told us what the Spas have to offer, and how they are transforming the banking experience. “We believed most financial institutions were pretty much all the same and that a new way of advisory interaction with clients was needed in the marketplace,” Reg said. Thanks to forward-thinking financial institutions, like BlueShore, the concept of combining services with pleasurable settings is beginning to take hold throughout the banking and credit union industries. Capital One Cafés, for example, offer traditional banking services in a café atmosphere, with Peet’s coffee, pastries, and free wifi. The cafes are a comfortable compromise between an increasingly online banking world, and the reality that some services must be done in person. BlueShore was ahead of the curve as far as transforming the face of financial institutions when it opened its first Financial Spa. “The opening of our first Financial Spa showcased our journey to become a very different type of financial institution,” Reg explained. BlueShore Financial has transformed member expectations with the environments it builds. That’s because when clients enter a Financial Spa, they are greeted by a concierge, a Refresh Bar, and the sounds of waterfalls and jazz music playing softly in the background. “Your senses are stirred by the soothing and serene atmosphere, enhanced by rich warm woods and native materials,” Reg said. The pleasant treatment and uplifting atmosphere continues in the advisory area, where clients enjoy free wifi, phone chargers, fresh-cut flowers, and displays of local artwork. There are also Kids’ Zones and coffee bars within the facility. BlueShore has a whole host of advisors, including financial, investment, insurance, business, commercial mortgage, and leasing advisors. Private, glass-enclosed meeting rooms play host to discussions on issues important to the client, such as financial planning and wealth management. 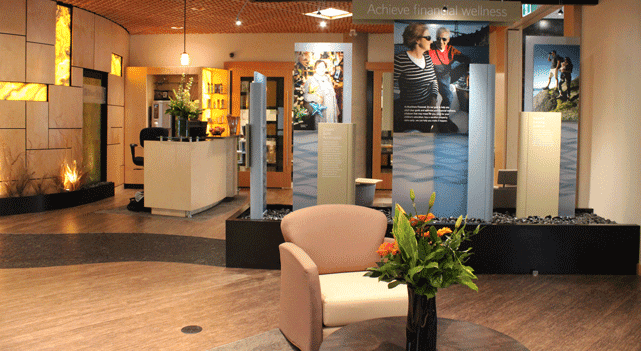 BlueShore Financial advisory areas are designed to host important conversations in relaxing environments. The teller area has also been carefully designed for a relaxing experience. “Inspired by the front desk of boutique hotels, they are open and approachable,” according to the BlueShore website. Computer monitors swivel between employees and clients for maximum transparency, TV monitors on the wall show financial tips, branch information, and local imagery, and low-level, wheelchair-accessible stations are readily available. Just as other industries are shifting focus and competing on customer experience, the banking industry is no different. Thanks to institutions like BlueShore, the consumer banking experience is changing for the better. 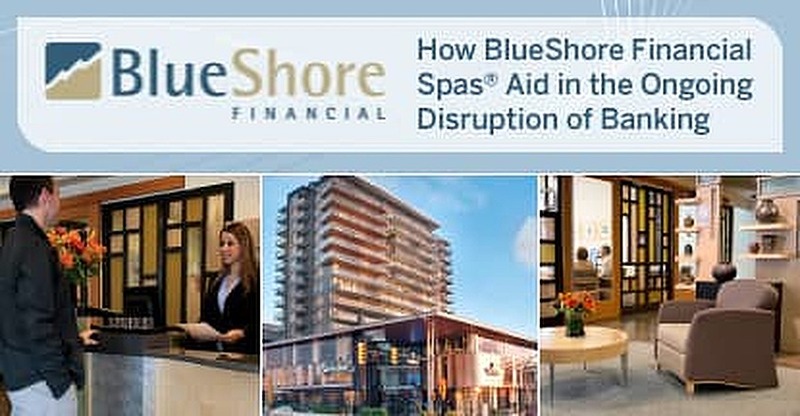 “Our Financial Spas have contributed to our positive client experience ratings, which consistently exceed competitors’ ratings,’” Reg said, adding that 81% of BlueShore clients say their financial institution is an expert provider of financial advice, versus 62% of clients from other financial institutions. Almost all of BlueShore Financial’s locations have been redesigned to fit the Financial Spa model. All but three of BlueShore’s branches have been transformed into Financial Spas, and the remaining locations are quickly catching up. Early next year, there are plans for a new spa opening in Kerrisdale in Vancouver’s west side. “Kerrisdale is a tremendous opportunity for us. We will have financial advisors, business advisors, and investment advisors all on-site, with large meeting rooms and a full Financial Spa experience,” Reg said.